Jameis Winston, Florida State's historic runs ends with a 59-20 loss to Oregon in the Rose Bowl semifinal of the College Football Playoff. PASADENA, Calif. -- King Joffrey had a good run. On Thursday night, however, the series came to an end for America’s favorite villain, as Jameis Winston and Florida State’s brilliant sprint through the college football record books came to a halt. It’s over. Kaput. See you next year. It was 59-20 in the Rose Bowl and the first-ever College Football Playoff game and, yes, it was that ugly, after Oregon scored four touchdowns in a third quarter that left Florida State breathless and bewildered. At the end, it also left a blemish on a previously spotless record. Now it’s time to say goodbye to one of the best. Let’s be clear about one thing: Regardless of what you think about Winston as a person -- and there is undoubtedly a wide range of opinion -- he is a terrific football player. The 2013 Heisman Trophy winner led his team to 27 wins on the school’s ride to 29 in a row. That included the 2013 BCS title, a 34-31 win over Auburn in this very stadium that quieted, at least momentarily, the SEC-is-king talk. Yes, he threw 17 interceptions coming into this game, but also 24 touchdowns and 3,559 yards. He rallied his teammates to numerous come-from-behind victories and brushed aside talk of being college football’s most-hated player. He is a far cry from America’s sweetheart, but can also be personable and funny and confident. And now his college career is likely a thing of the past. Winston is a paradox who can’t decide if he wants to be the hero or the bad guy, which makes him intriguing. What role will he play in the NFL? Is he capable of change? When the clock hit zero and his Seminoles teammates fled to the locker room, humiliated and heartbroken, it was Winston who stuck around to shake hands with Oregon players. He tipped his helmet to the Florida State faithful on his way off the field, and seemed humbled. 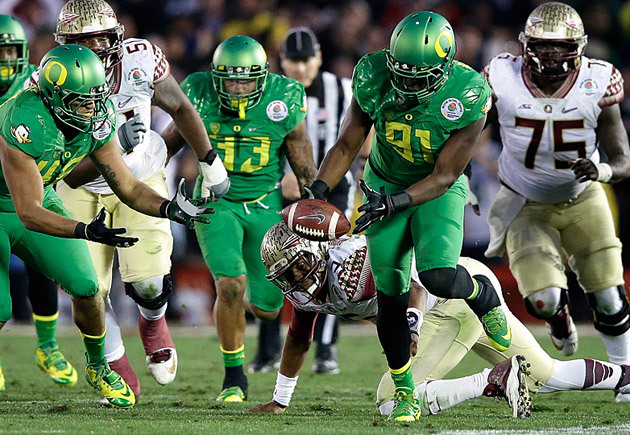 “That’s awesome,” Oregon defensive coordinator Don Pellum said of Winston’s postgame demeanor. Given the final score, there will be quite a few who take issue with that remark. But on this we can all agree: Winston did not play up to a Heisman winner’s standards on Thursday night. He finished 29-of-45 for 348 yards with a touchdown and an interception. This loss will not fall squarely on his shoulders, but two highlights (or lowlights, if you’re a Florida State fan) will be shown repeatedly. Fisher said afterward he was simply asking Winston what happened on the play -- Winston told him one of Florida State’s receivers slipped on his route, forcing him to scramble -- and that Winston often gets “animated when he talks,” even when he’s playing well. 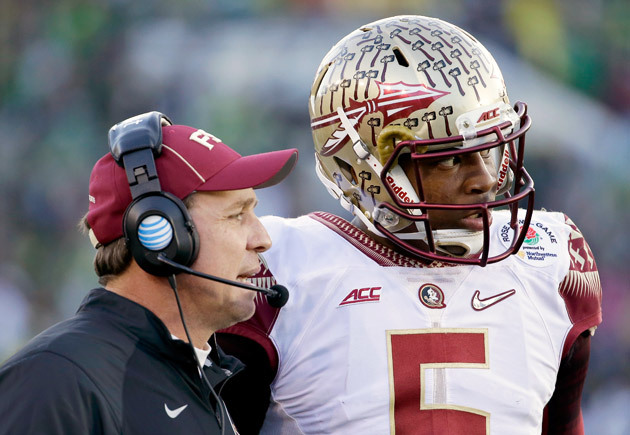 It was hardly the beginning of Florida State’s problems. The Seminoles’ narrative all season had been to fall behind, then capitalize on their foes’ second-half mistakes. On Thursday that narrative flipped, with the Ducks taking advantage of Florida State’s errors while the Seminoles looked around gasping for air and help (Oregon plays at breakneck speed). In the third and fourth quarters Florida State turned the ball over on five drives; each time Oregon responded with a touchdown. Two of Florida State’s turnovers came courtesy of freshman running back Dalvin Cook, the Seminoles’ best offensive option for the first 30 minutes. At halftime the 6-foot, 200-pounder had 90 yards on 12 carries, a 7.5 yards-per-carry clip. As media, fans and casual observers wondered why Fisher didn’t hand the ball to Cook every snap, it became clear(er) in the second half: He has a tendency to give it away. Cook fumbled twice, and Oregon turned both into scores. He finished with 15 carries for 103 yards, and no touchdowns. In a somber and almost silent postgame locker room, star Seminoles wide receiver Rashad Greene sighed deeply. Considered one of the biggest mismatches in the Rose Bowl, especially after Oregon’s All-America cornerback Ifo Ekpre-Olomu got hurt, Greene was held in check all night. He sympathized with Cook’s play, but said screaming at a rookie wouldn’t have helped. Winston wasn’t ready to let go that easily. He claimed he hasn’t thought about the future, the looming NFL draft or the ‘Noles’ baseball season. (He is primarily used a closer for Florida State, recording seven saves in 2013.) He is forever confident -- and forever slightly unrealistic. Except that for Winston, it likely is.